Confession: I am obsessed with herbs. Gripped. Infatuated. Besotted with herbs. Last year we dug up a patch along the south side of my house and I started an herb garden, with flat slabs of limestone for edging and paths, and a handful of starts from my aunt and a few friends. Thyme. Sage. Rosemary. Chives. This year I am somehow, miraculously, close to thirty varieties. Many are gifts from friends, some are pilfered from random parks and things, some are greenhouse finds… one a last-minute gift from a very sweet greenhouse owner at Pampas Creek in exchange for the promise to come back again. What is it about herbs? They’re so full-bodied–good to smell, good to taste, good to touch. Low and fragrant, vibrant green. I love the classics—peppermint, parsley, basil, oregano, Echinacea, bee balm. And I love branching out into a few crazies—barbecue oregano, wooly thyme, purple basil, Russian sage and—my newest newbie—stevia. Everything is small, still, and learning to find its place in the world. Some varieties don’t do well. 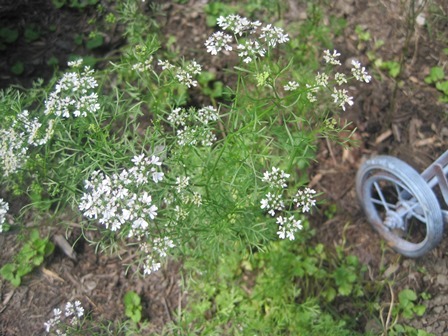 My dill looks like it thought “yellow and straggly” was hip this year, my rosemary didn’t survive the winter, and my cilantro went to seed too quickly… Oh, and I can’t grow herbs from seeds to save my life. “Starts only!” is my banner from here on out. Dill. No really. I’m serious. This is my dill. I left the label in the ground beside it so I wouldn’t forget. 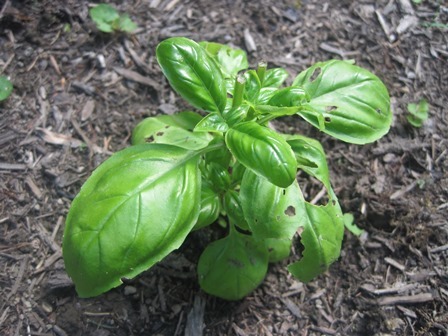 Basil–somebody tell me how to keep it from getting eaten! Rosemary. This year’s version is in a pot so I can bring it inside before winter. I want to learn more about using herbs, in cooking and teas and home remedies. Right now, I fiddle around with them, snipping cilantro into refried beans and using fresh parsley and thyme in my tomato sauces. Mostly I walk through the garden and touch and smell, and taste heaven. 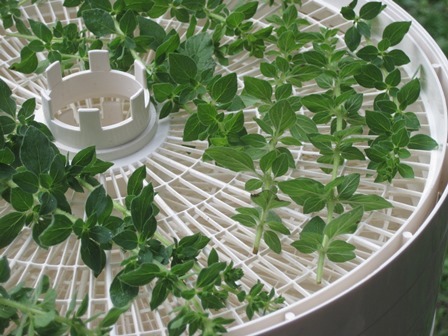 I just gave my oregano a haircut and dried it in my dehydrator. That was fun. In a jar, all ready to crumble and use. What do you love about herbs? How do you use them around the house? I’d love to share! Stop by. I actually bought two–the first one at Miller’s Greenhouse because I wanted to give it a try, and the second at Pampas Creek Perennials because it was twice as big, and so healthy-looking. PCP is well worth going to! though their season is probably almost over. I discovered them for the first time this spring. 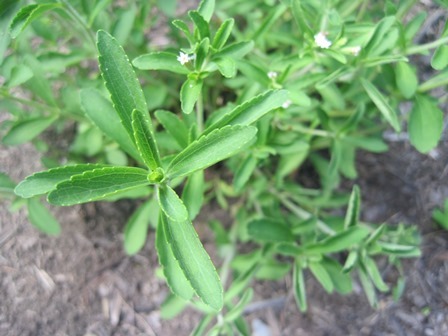 Valesky’s greenhouse always has stevia…though probably not now. Love it! Looks like so much fun. One of my favorite ways to use basil is in omelets. I sauté squash or zucchini, onions and jalapeños, then spoon them into an omelet with lots of fresh chopped tomatoes and some fresh basil. And cheese. Mozzarella if possible. Yum. 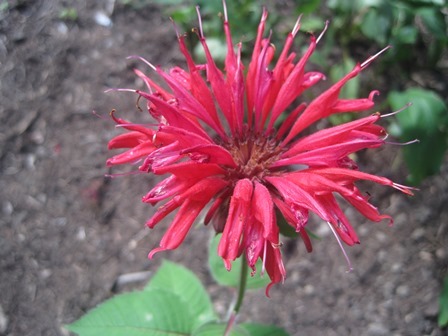 What is bee balm for? I didn’t realize it’s a herb. 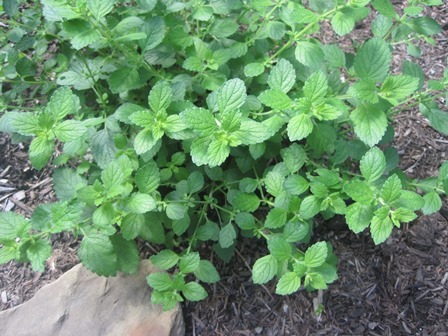 We add it to our mint teas just for flavor, and mix it with mullien and peppermint when we have a cough. On another note, I’m enjoying cinnamon basil in smoothies and added to fruit salads, and we just had coleslaw with fennel(Simply in Season) and we liked it! Just a suggestion on the herbs.. you may want to do a test… my sister dries a lot of tea, so last year to help her out I cut off a lot and dried it, leaving the stems ON. The next time around we took all the leaves OFF the stems before drying it and the smell was more ‘fresh’. 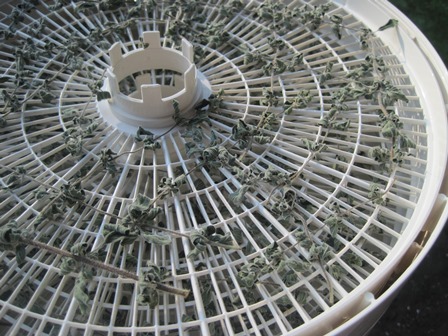 (: We had just air dried it, so maybe with your dehydrator it doesn’t make a difference. i know you found starts easier for the majority, but don’t be too quick to say no seeds. 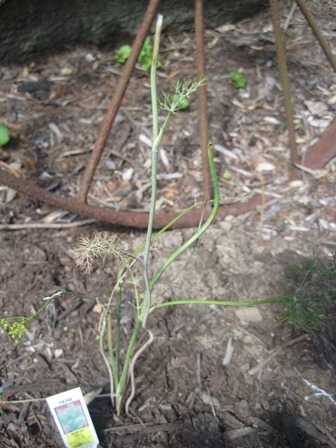 you likely would have had more success with a packet of dill seeds as they hate small pots and having their roots disturbed when they are transplanted. 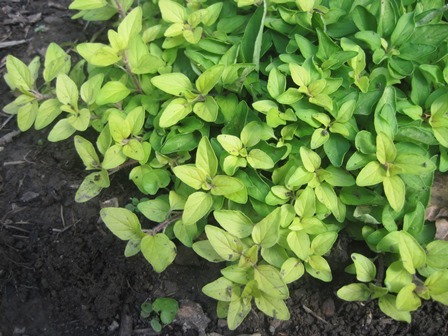 and in answer to the above question beebalm can be used to make tea, or as a substitute for oregano in cooking. I’ve killed rosemary 3 times trying to overwinter it (some learn quicker than others). Glad to see it’s not only me. I also cannot figure out how to prevent cilantro from immediately going to seed. Again, glad to see it’s not only me. Pleased to be in such great company. Don’t you love my helpful comments? you may have better luck planting the seeds directly in the garden. it doesn’t take well to transplanting. 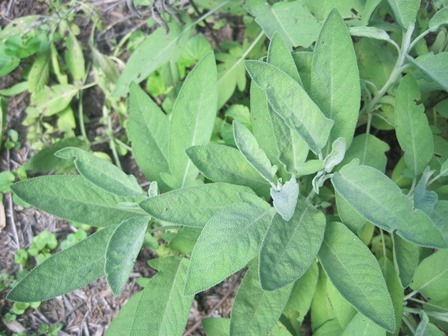 I tried Stevia this year too! But I don’t think it likes our weather-it just isn’t growing. I wish I could share my dill with you. I started it from seed and it is beautiful. Unfortunately my cucumbers are a long way from pickles so my dill is not getting used. Fresh dill and parsley are great with potatoes and carrots in a foil packet on the grill! Your dill looks exactly like mine except mine is non-existent by now. I started it in a small pot and it just didn’t do well. I was smirking inside (at myself) as I read this. I have a pot of 4 herbs, doing beautifully! —basil, oregano, rosemary, and thyme. I THOUGHT I had them all down by memory because I didn’t mark them. I should know that never works with me. So……when I saw your eaten basil plant, I was like, “That looks just like my oregano!” Groan………. Oh goofy me….I don’t know why I’m even growing herbs. I’m not an herb freak, but I just thought it would be fun. And it is! But I need some help in what recipes to add my 4 herbs into. Do you have suggestions? You’re hilarious. 🙂 Okay, one recipe suggestion each. 1. Basil–Caprese salad. Google it, but basically thick slices of good tomatoes and fresh (soft) mozzarella, sprinkled with snipped basil, oil & vinegar, salt & pepper. YUM. 2. Oregano–Bake a spaghetti squash and shred, then top with a meaty tomato sauce and fresh oregano–also parsley or anything else you have. Sprinkle with Parmesan. 3. 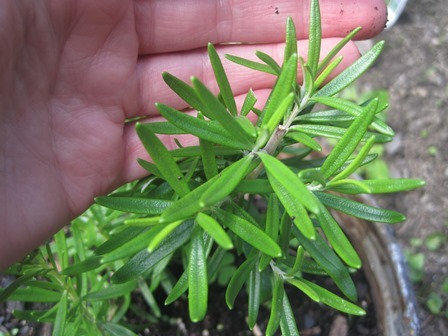 Rosemary–I love it on baked chicken thighs, or added to herb breads and buns! 4. Thyme–Wrap a chicken breast in bacon, and top with thyme leaves. Bake till just done, and serve with barbecue sauce if you want. I’m by no means very intelligent in herbs so far…. but in the experience I have… we LOVE Fresh basil in our tomato/basil soup, on breadsticks or in the pizza sauce you dip them into… yes, nothing like fresh cilantro in salsa or anything mexican… and that dill makes the EASIEST and BEST canned pickles. (all in ONE day!!) just put a sprig in the bottom of the jar along w/ a garlic clove, and an onion wedge, fill w/ sliced cucumbers then repeat on top, I think thats all theres too it. Yumm!! Ah, fresh herbs- a real gift from God! A Peach Basil Ice Cream Syrup, sounds strange, but is wonderful! Make a sugar syrup by boiling equal parts of sugar and water. Actually I would use less sugar and sweeten it more with a liquid stevia extract. Then make a stack of basil leaves, roll then into a tube tightly, and slice. It is so much fun and makes cool strips!! Add it to the syrup and let it steep awhile. Strain it, cool it, and add chopped fresh peaches. Can eat it on ice cream, or add lots of peaches and just eat the peaches! Are slugs eating your basil? You could get some DE (diamataceous earth) and sprinkle around them. Boil small potatoes, maybe 1 1/2 inch ones. Drain and then drizzle olive oil on a cookie sheet. Mash the potatoes with a handheld potato masher, or the bottom of a drinking glass. Drizzle with more olive oil, sprinkle with sea salt and fresh cracked pepper, and chopped fresh herbs. Chives and rosemary are great. Put in a 425 degree oven for maybe 15 min. Yum! Mmmm! I love herbs too. Though I usually just grow them and enjoy walking by and petting them and not cooking or otherwise using them. About once a summer I make a big batch of basil pesto to enjoy all summer and I throw parsley and rosemary on lots of things. Actually right now, my herb patch is covered in such a thick layer of weeds (which grew up last summer during my pregnancy and have never been evicted) that I can’t find most of my perennial herbs. I was going to add a few comments – but I see that others beat me to it. But I’ll just throw in my opinion on the floor. 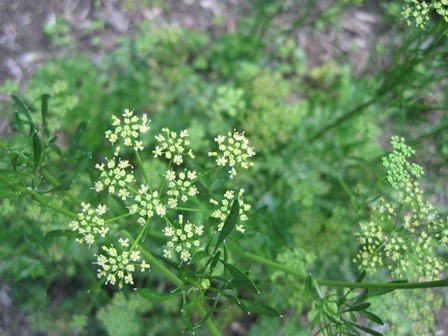 On seeds – you really need to grow basil and dill by seed. They do SO much better when planted directly in your garden and not transplanted. On rosemary – this is considered a tender perennial in my area – and you live north of me – so I’m guessing it would be the same for you. In other words, you might over-winter it IF you have a mild winter and IF you have a protected area – but don’t expect it to survive unless you move further south. This was a refrain I repeated often when I worked at a greenhouse. I just plant it in a pot and move it in for the winter. Then I get to enjoy it all year! A few drops of Dawn soap to a gallon of water, and poured over the foliage of your plant is a great insect deterrent. Advice given me by a horticulturist, and it works! 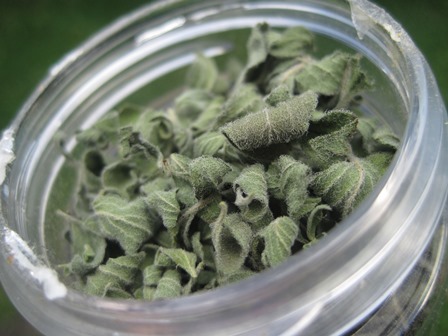 Btw, if you wanna hash out herbal/medicinal stuff – you should talk to my sister Andrea Graybill. She did an herbal consultant course and is quite knowledgeable…and has been known to make many of her own homemade medicinals (Echinacea tincture, Comfrey Salve (this stuff is AMAZING! You can use it on cuts, scrapes, injuries and it works wonders. I even use it for my baby’s diaper ointment crème and it’s a marvel. ), etc. Happy herb gardening to you! I love my herbs too! I have never had as many as you have, but I always keep a few. Basil, Oregano, Parsley, Dill(if it grows) Chives, Apple Mint, and Peppermint are a few that I have to have. I throw in an extra one or two depending on what has taken my fancy. I love to use my fresh herbs in everyday cooking. Nothing like stepping out the back door and grabbing what ever suits what I have cooking. But I really like to have them when I am canning my tomato stuff. I roast my tomatoes to make my sauces and fresh herbs thrown in the mix is just lovely!